Did you put the riecoin.conf file in the same directory as your wallet.dat? Had 48 cores at 3.4 going at launch, added another 64 at 3.2 by about midnight EST, added another 24 at 2.8 this morning. 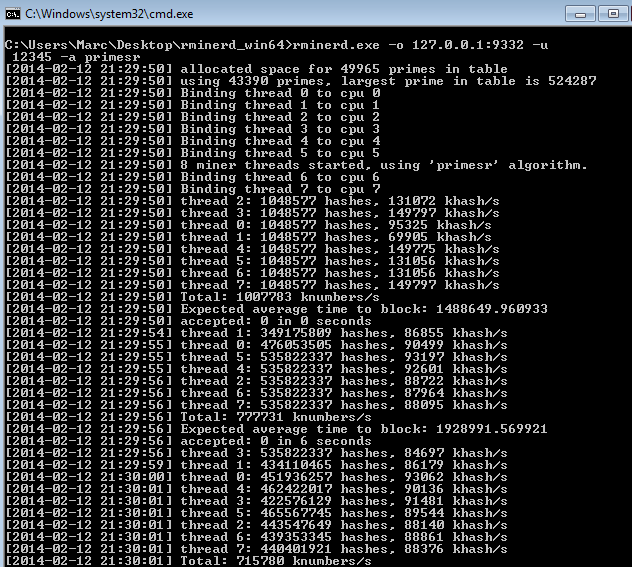 So far, 136 cores & zero blocks. Probably time for me to pack up and walk away until riecoin finds a pool for itself. There is "deamon=1" and nothing under this. I think I will give up solomine this coin truly. WTB 50 RIC. 50 RIC = 0.05 BTC. Pm me. Just a quick question, is it the right way ? Just have to wait right now ? He asked me to show him on TV, blocked my kb and mouse and tried to get my coins, watch out! 14 cores here and I got the second full value block. Blind luck I tell yah! Nothing since then so I'm stopping until a pool is formed. Someone smart make a pool! I am trustee for NXTcommunityfund so I am good for the BTC. This is personal purchase. Seller sends first in increments, or we use escrow, so scammers need not bother.